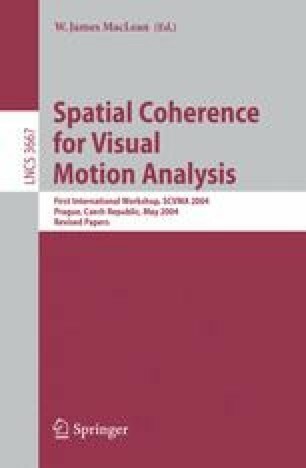 In this paper, several important issues related to visual motion analysis are addressed with a focus on the type of motion information to be estimated and the way contextual information is expressed and exploited. Assumptions (i.e., data models) must be formulated to relate the observed image intensities with motion, and other constraints (i.e., motion models) must be added to solve problems like motion segmentation, optical flow computation, or motion recognition. The motion models are supposed to capture known, expected or learned properties of the motion field, and this implies to somehow introduce spatial coherence or more generally contextual information. The latter can be formalized in a probabilistic way with local conditional densities as in Markov models. It can also rely on predefined spatial supports (e.g., blocks or pre-segmented regions). The classic mathematical expressions associated with the visual motion information are of two types. Some are continuous variables to represent velocity vectors or parametric motion models. The other are discrete variables or symbolic labels to code motion detection output (binary labels) or motion segmentation output (numbers of the motion regions or layers). We introduce new models, called mixed-state auto-models, whose variables belong to a domain formed by the union of discrete and continuous values, and which include local spatial contextual information. We describe how such models can be specified and exploited in the motion recognition problem. Finally, we present a new way of investigating the motion detection problem with spatial coherence being associated to a perceptual grouping principle.